It was about eight pm on a weeknight almost eighteen years ago, and I was minutes away from beginning my live on-air program on The Weather Channel. Having recently returned from a vacation in Washington State, I was still playing catch-up with my weather information and hurriedly putting the finishing touches on my presentation for air. My desk phone rang. I should have been on the set already and didn’t have time to talk, but I sensed I should answer it. “Weather Channel,” I blurted into the mouthpiece. It was my wife on the other end. She was still in Washington with our kids, taking a few extra days of vacation before returning. “Are you sitting down?” she asked. "Yes, why?” I answered, a red flag immediately unfurled. “What?” I yelped. I was having trouble picturing our oldest boy in the hospital. Besides, I always thought a broken arm was something you get patched up at the Minit Clinic. “What does that mean?” I stammered. “Of course. How did it happen?” I asked. "Andy doesn’t skateboard.” I stated, confused. Yes I did. There wasn’t anything my thirteen-year-old son wasn’t willing to try. Usually that was a good thing. Not this time. Just then my on-air partner called to me. “One minute,” she warned. I hesitated, and then caught myself. “Tonight we are dealing with possible severe storms in the Plains.” I walked to the green wall, and then, glassy-eyed and on autopilot, cycled through my maps, trying to explain the forecast with as much zeal as I could muster. I couldn’t muster much. A few days later, my wife and kids were back home, Andy sporting temporary casts on both arms. Since those casts weren’t mean to be worn long-term, we made an appointment with a local orthopedist to see where we should go from there. In the meantime, he could do next to nothing with his arms, which hung as two almost useless appendages at his sides. Most people would be able to get by with one arm disabled, but having two out of commission was something else. Andy did manage to feed himself, though it was slow and awkward. He went to school but could only write slowly and nearly illegibly. It wasn't all tragedy though. Our son discovered that he was suddenly among the most popular students in his eighth-grade class. Girls fell over themselves to carry his books, and he got to tell about his skateboard adventure multiple times. Plus, having two casts allowed him twice the number of signatures as normal on them. His mood improved. The local orthopedist took off the old plaster, replacing it with two multi-colored and waterproof casts that afforded more dexterity for his fingers. Not only could he once again hold a pen and write legibly, he found that he was able to swim in the neighborhood pool, and to his bountiful delight, handle video games. Andy even managed to play his clarinet in band class, at least to some extent. He had been first chair the year before, but his casts affected his audition, and thus relegated him to second chair. The new first chair tried to exercise the usual bragging rights that came with being top player, but it was difficult to convince anyone that beating a section mate with two broken arms was any great feat. And at the fall concert Andy was the unintended celebrity anyway, sticking out like a sore thumb (or more precisely, a broken arm), playing every piece adorned with two neon-toned fiberglass wrappings. Meanwhile, I dealt with the insurance company, which, even after several phone calls, couldn’t seem to understand the exact nature of Andy’s injury. Repeatedly the company paid a claim on one arm but denied treatment on the other. Insurance covered one cast but refused to pay for the second. The company covered surgery on one arm but rejected the claim for the other. Finally I was able to reach a supervisor who told me the reason for the denials. "The claims were all duplicates," she explained matter-of-factly. Eventually Andy’s arms healed, the insurance company was finally satisfied, and my son went back to being just another eighth-grader with two normal functioning arms. Even so, there were lasting effects: his skateboard-injury story lasted him through the rest of the school year, and his father continued to be amazed at how resilient and determined a young teenager can be. My son even managed to achieve some level of near-immortality in his middle school’s band program. Until this day the band director has used the valuable ammunition Andy gave her to silence any excuse-prone clarinetist. There’s a purpose in everything, I always say. I'd love to hear your broken bone stories. Got one? Scroll down and hit "Leave a comment" and share it. 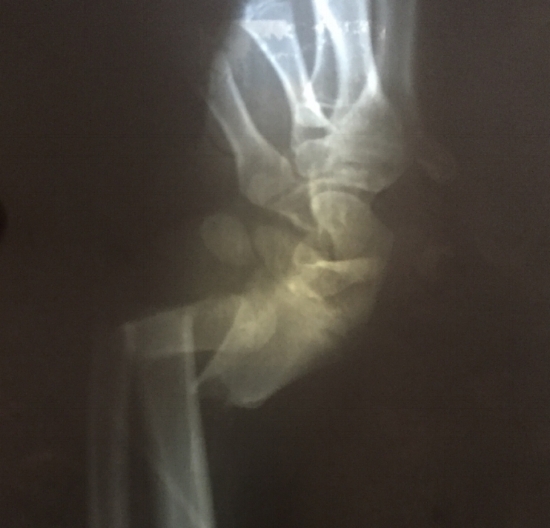 An X-ray of one of Andy's arms, his hand completely separated at the wrist. In case you were wondering, Andy now has complete use of both arms.